There it is, a body on display, delicate fabric hugging its frame as if a part of its existence from the very beginning. Porcelain skin adorned with silk, the material complements the complexion. The figure stands there without concern for the wondering gaze of any passersby, a translucent wall erected between it and the endless faces. Society is kept at bay. The soft glow of light dancing on the surface of the sheet of glass serving as its imprisonment. It shimmers ever so slightly, creating prisms of color in the endless shuffle. The rays of light trails over the delicate frame of the figure. Beauty blossoming from a thing of tertiary value. But this is not Violet Evergarden I'm describing. Look beyond the object, beyond the fabric; zoom pass the crystalline glass wall, and suddenly, the true image of my purple prose takes shape. There it is, coming into focus, a JC Penny's mannequin positioned at the window front of a shopping mall district. The dancing lights, nothing but the cheap glow of neon signs from neighboring competitors adjacent to it. The wondering gazes, nothing but customers with money to spend. If embellishments for something so minuscule is all you need to be entranced by the item being described, then Violet Evergarden will not bother you. However, if you desire content equally as deserving of the words being used to describe it, then it might benefit you to move on to greener pastures, because like this opening paragraph, so too is the material on display hyper-stylized rendering of a truly insignificant thing. The main difference being the tool; flowery words traded in for audiovisual frontloading. Layered color gradients supplemented in place of proper diction. Lots of icing, very little cake. But it's not all a lost cause. VE's story is one of relation. Or rather, everything surrounding it facilitates sentiments easy to relate too. One that practically writes itself. A person used as an instrument of war attempting to find ways to rekindle their lost humanity. An appointed position that gives opportunities to do just that. A girl disciplined in strict military decorum. A puppet with its strings cut loose, unsure as to what to do with her newfound freedom. She's a lost child, forgotten by society, forced to start from scratch. A holdover from a wartorn nation whose usefulness is brought to a crossroads. The story ends with the closing of one chapter, as we begin the journey of another. The journey is that of recovery. A journey aided by the guiding hands of someone not there in the flesh. Efforts made from beyond the grave for her betterment. One that will serve as her driving force towards improvement as well as the source of her grief as she draws closer to the answers she seeks. Through her, we're introduced to this world. One made up like a quilt of different time periods and cultural influences, all stitched together to create something new. Victorian era structures serve as the city skyline while the undeniable look of early 20th-century technology takes the form of motor vehicles, as well as a wide assortment of widgets and trinkets littered throughout the environment. Our person of interest, Violet, equally as blended. Her appearance is that of an unassertive young woman, while her mechanical limbs tell a different story. One of violence and darkness. This temperament reflected in her personality. She only sees things in utilitarian ways; typewriters are weapons, school is a mission, her job becomes headquarters, saluting whenever given orders, requesting permission for all her actions. Social graces are completely lost on her. Her upbringing robbing her of the privilege to decide. There was only ever one path for her to take. Until recently, her actions were that of a blade, sheathed, just waiting for the time that its usefulness was required once again. An instrument of death whenever its wielder sees fit. Her new job changes that. She must write for others as an "Auto Memory Doll," a profession where she's tasked to transcribe the feelings and thoughts of others, giving a voice for those that have trouble doing so on their own accord. A job where recorded sentiments are captured in a letter. A chance for an emotionally stunted girl to learn what feelings are. A "doll" wanting to become a doll, when in fact, the act of becoming one is what brings her closest to humanity. As I said, the show writes itself. A self-oscillating arbiter of "good content" for anyone wanting to express why it's "good content." The mere act of explaining its basic premise does the legwork for them. Except for the fact that when the content is lifted from the pages of its screenplay and brought to life by the magic of animation, it's equally as flaccid as the diegetic information would have you believe when following a character of such stunted social growth. It's a show perfect for overthinking, perfect for negating any naysayer, where issues are fended off as "it's meant to be that way." Subject matter created to facilitate a drab character doing things in a drab fashion. A machine-like girl with mechanical limbs given a task to emulate empathy. Her stilted, often wooden personality is accounted for by her upbringing. She's that way because she's SUPPOSED to be that way. It's all very self-serving. "To wear one's faults on their sleeve" taken quite literally. It would have worked too, had there been no viable means to circumvent such insular logic. But here's where knowledge supersedes those counterarguments. Where one's experience can allow criticism to stick. This isn't the first anime to house such themes. And of those that did so before it, there are definitive examples of "better" out there disallowing the open acceptance of wooden behavior solely for the fact that the character's given circumstances allows it. Humans aren't that flat. To enable such simple-minded evaluations in place of spotting genuine issues is to trivialize the complexities of the human race altogether. We already know what it would be like for an apathetic person unable to function without the strict regiment of paramilitary life because we've seen it done with a pedigree of writing befitting the serious subject matter. People that carry the baggage of their actions, the haunting memories of the things they've seen, unable to let go, to fully allow oneself to be integrated into society. We know what this looks like because well-developed personalities like Kazuki Fuse from Jin-Roh exists. Major Motoko Kusanagi from Ghost in the Shell exists. Scar from Fullmetal Alchemist exists. PTSD is not a scapegoat for underwritten performances, and it should never be accepted as one. These issues are made visible by VE's very crowning achievement. Pristine art and animation that ends up highlighting the thin veneer of its inherent value. The undeniable look of sterile sleekness. The artifice of humanistic warmth made bare by the prim and proper order towards everything on display. Everything and everyone is made beautiful. Age, circumstances, genetics; none of it matters. Mandated aesthetics dictate this world. You die beautifully. You get angry beautifully. You get beaten up with style. Even tears are delivered with streams of diamond-like orbs, with the owners' faces made for the camera. Everyone in this world like that of runway models, all given a chance to play civilians. Realism made implausible when all inhabitants look like they should be doing photo ops for H&M brochures. Any attempt at realism placed further on cease-and-desist when glimpses of battles are depicted with shounen-like fight sequences. A place where even the grim outcome of war must be performed with a sense of commissioned poetics, all done to appease the vision of a director too busy with their pursuit for a particular aesthetic to let the content speak for itself. Content that effectively gets in the way of its own vision because it's never granted the chance to breathe. Natural light emulation that aims for Call Me by Your Name but lands somewhere along the lines of The Visit. How an anime could suffer from overexposure is beyond me. Goes to show you that when you emulate without understanding, the issues are copied as well. Time-lapse photography used in every episode, not for any purpose other than to show off. Lens blur effects used for flashbacks and present-time, not because there's a reason to but because the director can. Everything is in service of this perfectness. This very unnatural attempt at being "natural" utterly self-defeating of its intentions. This is equally true for moments underlined with genuine character outbursts. Silence is powerful. Playing music over every scene is amateur. Words drowned out by plucked strings, the steadily held notes of a violin, piano keys dolled out just as quickly; all of this without concern for what the characters are saying. Entire dialogue exchanges where silence is appropriate is washed out by a wall of sound. It doesn't compliment the material; it hijacks it. There's a time and a place for everything, this anime never come to realize that fact. It may take drowning out its content before one take notice of what good is there, but in that regard, Violet Evergarden is not without merit. Our protagonist may be an empty vessel with flickers of humanity tucked inside, but thankfully we're not made hostage by her presence, as every chapter in VE is in service of someone else. People of far greater interest than herself. Their emotional range not limited—even when presented with the same aesthetic brushstrokes that everything is painted in—their humanistic tendencies find a way to radiate outward. And as a vessel, Violet is given a chance to charter her clients' emotions to those on the receiving end of the expressed affection, and through that task itself, is able to find a way to expound upon her own feelings in return. The broad spectrum of accumulated emotions serving as the proxy towards finding her own. The idea itself is very appropriate. I would even go as far as saying that it's thoughtful. It also operates with a pace befitting the subject matter, even if that pace is considered to be a problem to some. These things need time to happen. Thankfully, Violet is alotted that. ▸The story of Iris, a girl named after the flowers in bloom in her small village, seeking out an existence away from her meager upbringing. Unwilling to accept rejection, an act of stubborn pride catalyzes her steps forward. ▸The story of Luculia, a pleasant disposition befitting the flower she's named after. She puts the feelings of her loved one ahead of herself. Hoping for their eventual emotional recovery from a tragedy that robbed them both of normalcy. ▸The unofficial sigils of two kingdoms: one a white rose, the other red. Lovers-to-be and penpals brought together by political circumstances, but share a love that aligns beyond the expanded power and peace of their union. ▸The final days of a mother, the autumn leaves fall as a countdown to her departure from the land of the living, wanting nothing more than to find a means to comfort the daughter that she's leaving behind. ▸The blanket of snow that covers a warring nation in frozen stasis. People refusing to move forward. Like their winter surroundings, they too remain cold towards each other, leaving their country in a state of civil unrest. And then there's the story of Violet herself, named after a wildflower in bloom; she's plucked out of the custody of a heartless man and into the care of one that sees beyond her reduced form. A disheveled mess, only treated as a tool, one meant to be used and later disposed of; the man sees differently. He wants her betterment at any cost, even if that means paying the ultimate price. Her intent is earnest, she wants to understand the expressions and feelings being directed her way, but like her mechanical limbs, so too is the show written with a sense of artificiality. An emulation of real-life that can't muster up to being anything more than that. Violet Evergarden is a beautiful plastic rose with stuck-on water droplets. It's well-kept. Never finding the beauty in decay. Never needing to accept the full spectrum of life simply because its creators are wholly content with being "perfect." True beauty is found in the blemishes. Within the scuffle of humanity's futility towards greater ambitions. True beauty comes from the majesty of life itself making mankind a mere moment in a pool of infinity. True beauty is humbling. It's through the imperfections that true beauty is emitted. Violet Evergarden is pretty to look at, but with the absence of this understanding, it could never be the real thing, it could never be "true beauty." Waking up one day and discovering Violet Evergarden getting an anime adaptation by Kyoto Animation should be a blessing. At least that’s what it looked like on the surface. The light novel series earned the grand prize from the Fifth Kyoto Animation in the novel category. Even with two volumes, my expectations going into this anime was high. In particular, the sheer visual quality is a sight to feast on. However, Violet Evergarden isn’t exactly just known for that but does that mean it’s something to be praised? Written by Kana Akatsuki, the light novel series is a story about Auto Memory Dolls. They are dolls are made by Dr. Orland, a scientist who used them to assist his wife in writing novels. However, these dolls were also rented out to others for service. 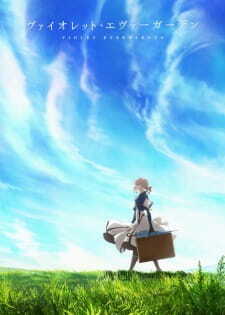 The main plot revolves around an Auto Memory Doll named Violet Evergarden as she tries to discover her purpose in life. As someone who came into this series half prepared (I have read parts of the light novel), I felt I was ready enough. The first few episodes came in as anime originals and that left me with some mixed reception. However, I will say that the pilot episode was a terrific picture. Beyond the lush quality and the visual magnificence, Violet Evergarden presented a story with heavy emotions. It synchronizes with the drama and melancholy of what I had anticipated. However, the main selling point of the show is titular character Violet Evergarden herself. The story feels like a character study that puts over her above the rest of the cast. Every episode focuses on Violet in some way through her role in the story, her interactions with others, and how she develops as a character. The conflicts she experiences tests her feelings and how she responds to them by trying to understand others. It draws viewers into asking questions about how she can develop as a character and in a lot of ways, I think the show did do that quite well. For instance, Violet displays a lot of human characteristics and tries to understand others. The most prominent scenes features her desperately trying to learn what “love” is and to me, this series chronicles her experience like a life journey of discovery. Unfortunately, I can’t really say that the first few episodes were well thought out in characterizing Violet as a memorable character. Beyond her expressions and role, it seems the show repeats a lot of the same things over and over. The example includes Violet expressing why she is an Auto Memory Doll and it gets tedious fast. It also doesn’t help much that the other side characters seemingly react in similar ways to Violet. My main concern for the first few episodes were mainly how this can keep viewers interested with such a way of storytelling. Fortunately, the series does get better and puts emphasis in some of the side characters. While the plot feels non-linear at times, some of the other characters do get spotlight through effective background storytelling. For instance, one of the episodes featured a 14 year old princess who gets engaged to a prince and while this seemed like a cheesy love tale at first, it resolved in a very emotional way. It gave me the impression that certain side characters are worth investing time into. In the meantime, the series does eventually step into the light novel adaptation territory as we learn more about Violet’s past and connection with someone very important to her. That person would be Gilbert Bougainvillea, a major in the Leidenschaftlich Army and someone that influenced Violet a lot since she met him. As we look at Violet’s past, we learn how they met and how much he treasure her like a person rather than a doll. It’s also important to note that Violet feels comfort whenever she is around him and not lonely. The anime in the present timeline portrays Violet as a very lonely character and doesn’t have someone to depend on. In doing so, it establishes Violet as a character that has a hard time understanding others. This is especially true for her after she heard Gilbert’s final words. The show dedicates time to explore Violet’s change since the past and how she reflects her experiences in the present. As I mentioned before, the series takes a lot of time into examining Violet as a character and getting viewers to understand her. The side characters play important roles in later episodes to make Violet reflect on her past deeds. To me, it’s effective storytelling as it really made me understand her behavior. The more I understood her, the more compelling her character became. I don’t know if this was the creator’s intention from the start but honestly, it does come together as a well delivered plan. Now you’re probably thinking of the story contains too much drama for its own good. In some ways, it does but in other ways, it’s also important for the main story. You have to remember that the timeline takes place after a war that Violet was previously involved in. Stories about war often involves pain, tragic memories, and even death. For Violet, she experienced the realities of war. Obviously, there’s going to be a lot of drama and its effect on the storytelling can be received with mixed receptions. I had some mixed feelings in general about Violet’s past as while it can definitely evoke emotions, it doesn’t feel unique enough to be memorable. In other words, I’m more interested in how she develops as a character in the present rather than focusing on her past. Even if it’s significant for her characterization, the drama presented in the background stories doesn’t always feel too impactful. I get it though. Some people will probably point fingers and say that it’s necessary. Others may agree with what I mentioned here. To me, I’m still more interested in Violet’s development in the present than who she is in the past. Otherwise, Violet’s role in the show feels more than just a protagonist. She is the character. Anyone watching this series will easily recognize the powerful production of the show. This is perhaps one of Kyoto Animation’s best work yet in terms of technical quality. The world setting has natural and lush landscapes with European style architecture detailed with vivid colors. Every camera shot feels impactful and there’s no drop in quality in any episode. Body movements are also timed precisely well to highlight every fine detail such as Violet’s character expressions and role as a doll. Speaking of which, Violet’s character design makes her look very elegant. If you haven’t known about her background story, it’s hard to recognize her as a former soldier. Her signature hand is also a trademark animated with impressive features. It communicates the message to viewers as what she is. Other characters in the show also stand out with their human characteristics. While there’s no fan service in the show, there are characters such as Cattelya that can be very pleasing to the naked eyes. It’s clear to me that Kyoto Animation and the creative team poured a sheer amount of effort into making this series as a whole. The theme songs also highlights a sensitive feeling of melancholy to match the series’ tone while character voice mannerism for the majority of the cast are able to keep up with their momentum. The music and OST also hits the mark to deliver what's intended especially for the emotional drama. It’s definitely a series that felt different to me compared to some of other Kyoto Animation’s recent works. This one was an emotional storyteller that gave us a reason why we should care about Violet Evergarden; not just the story but Violet’s own journey of discovery. While I can’t say it’s always an effective tearjerker, it’s still a show that’s worth investing time into. Well done, Kyoto Animation. You gave me a better hope for your future. This is the most memorable quote that had gone through my mind whenever I watched Violet Evergarden, and led me to ask myself this question: how do you learn an emotion? Experience? Knowing its definition? Or perhaps... By writing letters for others? Thus is VE's answer. I liked the novel, so obviously I liked the story. They did make me get worried with those original episodes at the start but later on they managed to adapt most of the best chapters. There are quite a few which are standalone: 5,6,7,10,11. The rest involved Violet and her co-workers. The first half didn't look that promising, but the second half improved a lot. I think it's because they put in a lot of her adventures in the second half, only involving Violet and the customer, which gave a lot more room for growth instead of being surrounded by the other workers. She's the type who learns fast when she's alone, you could say. Watching her change bit by bit a girl from emotionless and to some extent irritating to one who is able to experience emotions was very enjoyable. The story is not unique in the sense that she's trying to find the meaning of "love", but as it unfolds she learns other feelings as well, and soon enough we don't get the "I want to know the meaning of "I love you"" line. Pacing has sometimes been a problem, for example episode 6, where I barely got to know about Leon. They could've done more but I guess you have to expect that when you've got less than 20 minutes to cover an adventures. But in most cases they provided us with the right flashbacks and details to get to know the customers well. The anime did remove parts of the novel which were pretty bad: I'll start with witchcraft, a giant battle axe almost twice the size of Violet. I just couldn't believe that she could maneuver the axe so well, before she even got those robotic arms. Glad they got rid of that. They also made Violet very pacifistic compared to the novel, which helped to emphasize her growth even more, but this was at the cost of making her fighting scenes towards the end of the series ridiculous, since she chose to go head on without weapons at all, but still managed to take them down. Other reviews have pointed out the technological and cultural inaccuracies in VE, but personally it didn't affect me that much except maybe for those robotic arms which seem to be more advanced than one we have today... Rather, I was more annoyed by the battle scenes: a 14/15 year old girl fighting against trained soldiers, sometimes without weapons... I get that she is OP, but... the way her adventures unfold so conveniently at times was one of the main weaknesses of this show. There were some parts of the novel I would've liked them to include, for example Hodgins was supposed to visit Violet quite a few times when she was in the hospital and that helped to develop a parent-child relationship. They kind of tried to fit it in in between the adventures, but I don't think it was sufficient. The other thing is Violet's origins. They didn't go deep enough on that, and made people think that she became emotionless because of her time in the army. This is probably the best part and what made VE get such high expectations. The face expressions were great, the landscapes were great... If I was to point out the best ones, I'd say the scenes of the starry night (Ep 6), street lamps and the city of Leiden as a whole. I also liked the way they included flowers a lot throughout the series (especially Ep 5, you could see one almost very 5 seconds). The reason I'm mentioning this is because flowers are an important theme here: if you look at the names of most of the characters, they're all related to flowers. If I was to point out a negative... Sometimes, maybe this was just once, they put too much emphasis on scenes which didn't really deserve it. In Episode 4, when Violet was first introduced to the villagers, they suddenly went all out with the animation, including sudden gusts of wind and leaves dancing everywhere. It was amazing, but not really worth it. I liked the OP and ED, but that was about it. It didn't make me listen to it over and over again like Aimer's Ref:rain (best ED for me this season). The background music was alright, but they were often hit or miss: they would sometimes repeat it for too long and in other cases the music just didn't match the mood at all. But still enjoyable overall. From the blind obedience to kill to the development of a conscience which can heal, Violet's growth was truly remarkable, with the difference between her past and present crystal clear. Her blunt and fearless character had often been an obstacle against her success as a doll, but as the series progressed she managed to use them in the right circumstances. Her military salutes, her formal language, her expressionless face... They all changed. This is what the novel couldn't provide, those subtle details that show signs of growth. Only disappointment is the development of the other characters, especially Hodgins, Cattleya and Benedict. The novel lacked this as well, but I guess it was expected since so much was invested into Violet and her customers. Good, but not a masterpiece. Would I recommend you to read the novel? Give it a try unless you hated this. But there are going to be differences, both good and bad. If you can't be bothered reading the novel but still want to know what happens, you can PM me. “I want to know what love is” with this line Violet’s journey has started. It’s a journey of words, words that hold the power to influence the future of a person and change their perspective about the world. Finding the right words for the dear ones isn’t easy and Violet learns that through her encounters with different people who have a story to tell. The story is made with words, words on a piece of paper that can save a dear brother from despair, can show the love and carrying of a mother for her child even after she is gone, can make the parents understand what their child wants to do with his future, can connect two distant hearts that yearn for each other, can bring news of happiness or sadness to someone dear and finally can make people come to a mutual understanding. The letters that contain those words are the key to unlock the locket on people’s heart and break the iron shackles that put a restrain on their emotions. Each letter needs to be delivered to its destination because each written word represent the genuine feelings of its senders for the dear ones.Violet having a past filled only with cold words slowly starts to experience new words during her journey as a Auto Memory Doll, warmth words filled with compassion, affection, and love. Those words melt the ice around Violet’s heart and contribute to her growth as a human being. During her journey the world is filled with bitter words too not only happy ones but that doesn’t discourage her despite bringing back sorrow memories, in fact she comes to accept those words as part of her and grows stronger. She does her best every time to understand the meaning behind those words and give the right words to the persons in need of them. A sweet girl that lost the dear person to her on the battlefield, she stands up, raises her head from the ground, takes the first step and moves on in life despite the pain that weights a lot on her shoulders. I love you Violet! The pace is slow fitting for our characters and Violet’s growth, because life isn’t meant to be hurried, each happy moment needs to be savored and each hardship needs to be overcome, life is a battlefield were each of us has its own fight, it’s all part of being alive. The emotional atmosphere combined with the subtle visuals and gorgeous ost created around the character’s stories draw forth the raw emotions of its viewers and tears will be spend as an exchange. Violet Evergarden is a letter of love addressed to life, a lesson about the hardships and happy moments in life, it’s about getting up and moving on despite the obstacles that await for you and it gets better after each episode like the taste of a wine as it gets better with age. Thematically rich, visually breathtaking with alluring ost Violet Evergarden is a gem that may be hated by many viewers or hold a special place in the hearts of its audience, can bring peace of mind and sooth your hearth, it’s a show that needs to be savored for its special flavor called LIFE. As any journey that comes to an end it’s time to say farewell to our main heroine Violet who has reached her final destination but her fight with life will continue as long as she doesn’t give up, so my review of this enchanting show has come to an end. I wanna thank all of those who allocated a little of their time to read the words that I put on paper to create something that I hope will make a little change and give this show a try.